When my menu goes out the window, it’s always a good idea to have Plan B. At our house, I always keep the ingredients for this simple dish on hand so that I can avoid fast food. *For us literary geeks: John Steinbeck took the title of his 1937 novel “Of Mice and Men” from a line contained in the penultimate stanza from Scottish poet Robert Burns’ poem “To a Mouse”: "The best laid schemes o' mice an' men / Gang aft agley" (often paraphrased in English as "The best-laid plans of mice and men / Often go awry"). Prepare the rice according to package directions. 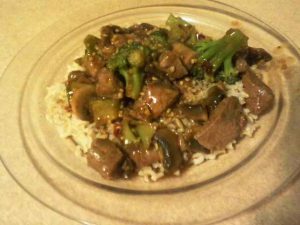 While the rice is cooking, mix the Beef and Broccoli Mix with the soy sauce and the water. Set aside. Heat 1 tablespoon of oil in a large skillet. Add beef and stir fry until desired doneness. Remove from skillet and drain. Heat another tablespoon of oil, add broccoli and stir fir until almost tender. Add mushrooms and continue to cook until the mushrooms just begin to lose their juices. Return the meat and stir. 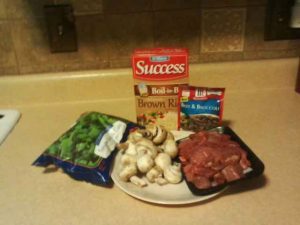 Add the Beef and Broccoli Mix sauce, stirring to coat well. Cook for 1-2 minutes, until the sauce is hot and slightly thickened. **If you’re on a budget, stew meat works just as well. Tenderize it, though, as it has a tendency to be tough. but the long cooking time helps make it tenderer. Sometimes I throw in 1 package of Raman Noodles (prepared). If you have a cookbook that specializes in great, quick meals, maybe we can purchase a copy for our shelves. To suggest a purchase, click here. Since dinner took hardly any time, you might have a few spare minutes. You can use those freed seconds to take a peek at the Library’s special “Culinary Exhibit” online The exhibit gives you a “taste” of what is available in the Library’s Culinary Collection. This special collection was conceived in 1989 by Susan Manlin Katzman to document St. Louis’ culinary history. All SLPL locations have a wide selection of cookbooks, but the rare, unique and valuable items as well as the menus are housed in the Rare Books and Special Collections Room of Central Library. To view this online exhibit, click bon appetit! This week’s guest chef blogger is Julie from Marketing, who is a literary geek.